Bring the past into the future. Re-conceiving this Interwar brick and sandstone cottage has completely refreshed the interiors with a contemporary edge and generous living areas flowing easily out to the garden. Key to the our design for the dwelling was a generous new living space opening to an outdoor room. The original boxy interior design did not allow for any sense of connection to the rear garden from inside, with only a small, paved outdoor area for entertaining accessed via a single door. The new extension replaces this underused space, opening the interior living areas onto an outdoor room via two generous bifolding doors, creating a family-friendly living area that flows into the terraced rear garden and lawn. 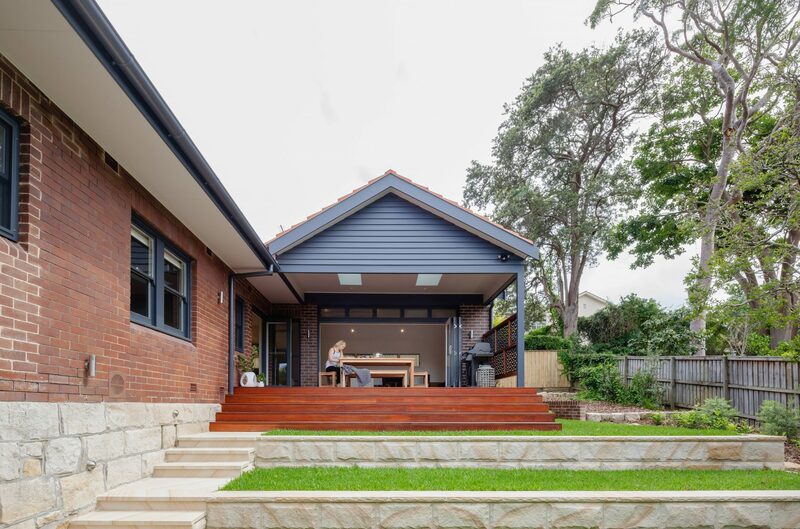 The gabled tiled roof, face brick facade and sandstone steps have been chosen to match the existing house and surrounding architecture in the suburb, framing the new opening at the rear in a contemporary take on a traditional form. Its interior is entirely redesigned to emphasis a natural flow between rooms, while retaining a strong sense of the original proportions and character of the dwelling. Skylights in the outdoor room, hallway and bathroom flood the house with natural light. A simple, neutral palette has been accented with a suite of monochromatic patterned finishes that create rhythm and interest across the dwelling.